I’m gearing up for the Valentine’s Day release! http://heatherhiestand.com/books/i-wanna-be-loved-by-you/ Sadie and Les are going to knock your socks off! Spies feature prominently in I Wanna Be Loved By You. Who is your favorite spy character in fiction? Given that the hero in this book, Les Drake, is a spy, he lies continuously to the heroine. Do you think someone who works undercover can ever be a reliable romantic partner? Sadie is a madcap heroine who does things like go on a several-hour train ride with a man she barely knows for a date. If you are really feeling the spark with a man, how much risk would you take to go on a date with him? Sadie was orphaned as a pre-teen and raised by elderly grandparents. How would this affect your outlook on life? Sadie has spent her life living with her older sister. All of a sudden, when she’s nineteen, her older sister moves away, leaving her without her best friend and support system. What life changes might you make under those circumstances? Sadie is surprised to hear her date’s accent changing as he interacts with other people. Would this be a red flag for you? What other red flags might make you want to end a date? Sadie flings caution to the wind to some degree because it’s her birthday and she’s lonely. What kind of birthday present would you consider acceptable from a date you don’t know very well? What kind of behavior do you like best from a work supervisor? This book is set in 1925 and I imagined a fairly paternalistic relationship between Sadie and her boss, Peter Eyre. How do you think work relationships have changed in the past ninety years? 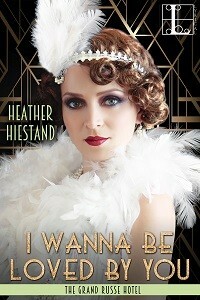 This entry was posted in Book info and tagged Grand Russe Hotel, heather hiestand, I Wanna Be Loved By You, jazz age fiction on February 6, 2017 by Heather.